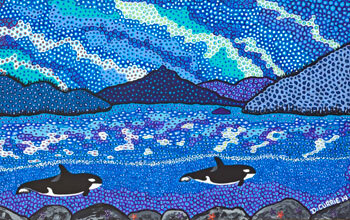 The incredible work of David Currie, one of Canada’s leading westcoast artists! The most noticeable feature of David’s work is his understanding of the incredible colour and diversity in nature. His unique style brings a new, fresh look that is in high demand! Currently painting live at the now famous Sea To Sky Gondola, Sewell’s Marina in Horseshoe Bay, Newport Market (Squamish BC) and on occasion at the Squamish Adventure Centre! 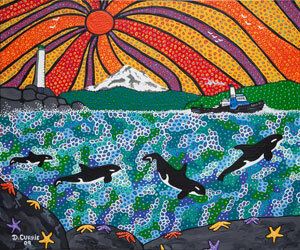 If you appreciate original westcoast art, you will love David’s work. Be sure and check out his prints and artcards. Our Beautiful Sea To Sky Gondola! 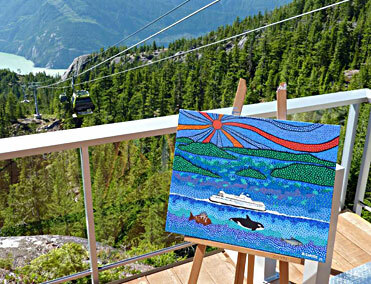 Artist David Currie paints high above the sea from the new Sea To Sky Gondola on the sunny westcoast of British Columbia. David has a chance to not only meet thousands of visitors to Canada but also be inspired with a viw unlike any other. 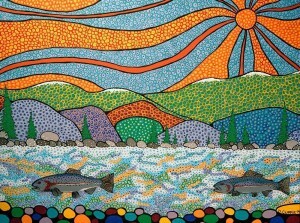 Painting on location, tourists and guests can meet David and discuss the views and the majesty that is British Columbia. Also available in the gift shop are prints and other gifts from this world class artist! Get Your Official Currie Artworks Artcards and Limited Edition Press Prints TODAY! For a number of fans and art collectors, having an original painting from David Currie may not be something they are ready to take home. But you can afford a beautiful limited edition press print or a beautiful Artcard. David has his original paintings (many in private collections or sold) available as a high quality giclee print, produced locally in Victoria, BC. A number of gift shops carry these press prints so contact David today and he can provide you with a contact to purchase these while they are still available! with donations of original paintings. David has donated to a variety of groups including BC Cancer Foundation, North Vancouver Outdoor School Alumni Society, Steelhead Society of British Columbia, ALS Society of British Columbia, Sannich Peninsula Hospital, Surrey Memorial Hospital, Whistler Arts Council to name just a few. Originals are available for purchase as well in certain situations for non profit group fundraising. Contact David today for more information. David Currie is a huge fan of painting on location and in particular on the waterfront of the beautiful coast of British Columbia. Growing up in lovely Victoria, BC and spending his youth on the coast, the warm, green, abundant flora and fauna inspire David to paint in the outdoors. 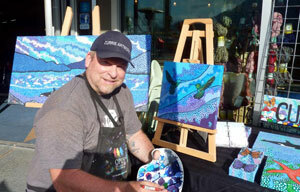 Painting at many well known marina’s and the communities of Whistler and Squamish, BC, David gets the opportunity to capture his vision of the westcoast of Canada while meeting tourists and art lovers from around the globe! Painting On Location Excites Me! I have really enjoyed my last few months Live painting in front of a crowd at different venues I am very thankful and appreciate the warm welcome I have received at the new Sea To Sky Gondola. It is a pleasure meeting with tourists from all over the world and the many locals that greet me with a smile and friendly chat. Also thanks to Sewell’s Marine Adventure Centre in Horseshoe Bay, West Vancouver..
Having a chance to Live paint in a amazing outdoor studio right on the beach with Blue Herons flying above, BC Ferries coming and going, the hustle of happy travellers all make me feel right at home. The coast of British Columbia always brings out the best in me. From fishing off the tip of the Island, Hanging out on the beaches of Quadra Island to watching Orcas swim off Haro Strait its always an amazing adventure. Dry rolling hills, amazing Dry fly trout fishing, baking desert heat and knowing that I have found my happy place… Best thing ever. Glacier green waters of Howe Sound up to the coastal snowy capped mountains of British Columbia. The smell of the Pacific salt and the crisp mountain air heightens my creativity. Dave has many fans around the world. Check out his Bio for more information on what inspires him! I am fortunate in that I have two of Dave's original paintings hanging in my house, love them. Every time I look at them I just have to smile. On behalf of The SSBC , we'd like to thank you for your long standing support and donations over the years. 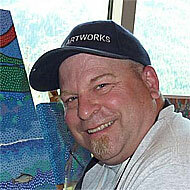 David paints and sells original works to a very select crowd and his work is displayed all over the world.. These high quality prints will not last long and are already in demand. Get your name on our list as new work is released. Connect with David online at FACEBOOK, and check out his latest work!